Sermo is a physician-only social networking community that has gained tremendous traction since it started. Ozmosis is another physician-only social networking community, but it hasn't seen the level of participation like Sermo. Why? I'm inclined to think that the main reasons is because Ozmosis doesn't really offer many incentives for physicians to join. If you don't have opportunities to make money, then why join or refer colleagues? Why spend time on the Internet when you could be doing other things, right? The other difference between is anonymity. On Sermo, most physicians maintain anonymity and they post anything. You're identified by your username, and that's about it (you can choose to display your actual name on your profile if you'd like to, but few do that). On Ozmosis, most physicians display their actual name (because you have to manually change your name if you want to maintain). In my opinion, the user interface on Ozmosis needs some work. Ozmosis has teamed with Veratect to offer real-time Public Health Alerts. The latest alert is this: New Jersey: State Officials Confirm 65 Cases of Influenza A (H1N1); "Concerns" Cause School Closures. I really like using meshmd. It's a physician only site too. I'm able to post questions anonymously (similar to Sermo) and I also use their groups area to manage elements of my office as well as a committee I sit on. Another great feature is that I was able to invite my secretary into my private office group so she could manage it for me. I find the interface easy to use and logical. Dr. Kim, thank you for your review, and I invite you to learn more about Ozmosis. 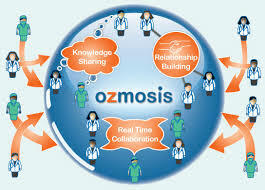 Ozmosis was created for physicians to share clinical knowledge in a secure and trusted environment. In medicine, knowing whom we get our information from and what our relationship is to that source, is critical in helping us evaluate the quality of information before we decide to implement it into our practice. This is why physicians use their real identities on Ozmosis, so users always know whom they are communicating with and learning from. Our physicians share detailed profiles, and similar to LinkedIn, a physician can instantly see how they are connected to another member. To further build a foundation of trust within the community, we protect every physician's privacy on Ozmosis and do not allow third parties to monitor conversations. With a wide variety of tools to draw from, including health alerts, virtual grand rounds, and social bookmarking, Ozmosis enables physicians to learn effectively from each other. We make it easier for our members to find what they need by delivering more personalized and relevant medical information based on their specialty and network of peers. This leads to an active physician community where our members contribute on Ozmosis because of their desire to share their experience and expertise with other physicians they know and trust. I welcome any physician who shares these ideals to join us on Ozmosis and help build a stronger physician community. I spend most of my time on Sermo, but I'm still experimenting with Ozmosis, MeshMD, iMedExchange, and a few others and I will post updates as I spend more time on these sites.